Open your eyes to a whole new world as you take on the awesome, underground adventure of caving in Melbourne! Choose between two awesome locations depending on how deep you want to go! Open your eyes to a whole new world as you take on the awesome, underground adventure of caving near Melbourne! Your adventure begins with an activity briefing covering equipment and the geological formation of the caves and unique fauna we expect to see. Teamwork is encouraged as participants navigate their way through the maze of passages and squeezes to reach their exit point. Your guides will be there to assist exploration and safety. There are all sorts of surprises to discover inside the caves including glow worms, cave crickets and other cave dwelling critters. Get ready to crawl, climb, abseil and get downright dirty! 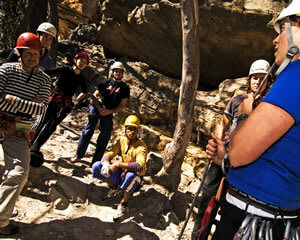 *The Caves at Yarra Junction are better suited for beginners or nervous cavers as there are multiple exit points. Labertouche caves require a greater level of commitment - please select which you would prefer at the time of booking. A minimum number of four people are required for tours to go ahead. Please note that new "Fire Danger Ratings" are now in place for Victoria. All tours will be subject to suitable weather and fire safety conditions as advised by relevant authorities. This may mean tours are postponed at short notice as Total Fire Ban Days are not declared until late afternoon on the day prior. This is beyond the tour operator's control, and we appreciate your understanding. Ian, our guide was exceptional, he was well knowledged in caving and has the patience of a saint!!! My son and I had a wonderful day caving at Britannia Creek with Adrenalin, and both learned a lot about ourselves in the process. We will definitely be re visiting and booking more adventures! Adrenalin set us up with the tour we wanted, with a very helpful and professional operator. The booking process was quick and easy. Recommended. I'm knocking on 40 and still up for adventures! I was the youngest in the group but felt completely comfortable and really enjoyed the caving day! recommend to all ages! ps. L for the t-shirt if I get it!! cheers!